For other uses, see Ore (disambiguation). An ore is a natural occurrence of rock or sediment that contains sufficient minerals with economically important elements, typically metals, that can be economically extracted from the deposit. The ores are extracted at a profit from the earth through mining; they are then refined (often via smelting) to extract the valuable element, or elements. The ore grade, or concentration of an ore mineral or metal, as well as its form of occurrence, will directly affect the costs associated with mining the ore. The cost of extraction must thus be weighed against the metal value contained in the rock to determine what ore can be processed and what ore is of too low a grade to be worth mining. Metal ores are generally oxides, sulfides, silicates, or native metals (such as native copper) that are not commonly concentrated in the Earth's crust, or noble metals (not usually forming compounds) such as gold. The ores must be processed to extract the elements of interest from the waste rock and from the ore minerals. 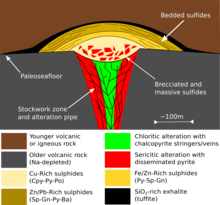 Ore bodies are formed by a variety of geological processes. The process of ore formation is called ore genesis. An ore deposit is an accumulation of ore. This is distinct from a mineral resource as defined by the mineral resource classification criteria. An ore deposit is one occurrence of a particular ore type. Most ore deposits are named according to their location (for example, the Witwatersrand, South Africa), or after a discoverer (e.g. the kambalda nickel shoots are named after drillers), or after some whimsy, a historical figure, a prominent person, something from mythology (phoenix, kraken, serepentleopard, etc.) or the code name of the resource company which found it (e.g. MKD-5 is the in-house name for the Mount Keith nickel ). Ore deposits are classified according to various criteria developed via the study of economic geology, or ore genesis. The classifications below are typical. 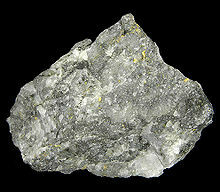 Lateritic nickel ore deposits, examples include Goro and Acoje, (Philippines) and Ravensthorpe, Western Australia. Magnified view of banded iron formation specimen from Upper Michigan. Scale bar is 5.0 mm. 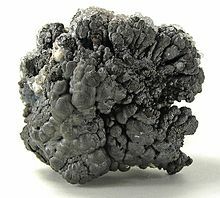 Lead-zinc-silver, typified by Red Dog, McArthur River, Mount Isa, etc. 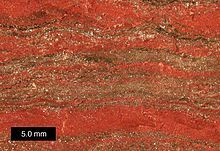 Stratiform arkose-hosted and shale-hosted copper, typified by the Zambian copperbelt. Conduct a pre-feasibility study to determine the theoretical economics of the ore deposit. This identifies, early on, whether further investment in estimation and engineering studies is warranted and identifies key risks and areas for further work. Conduct a feasibility study to evaluate the financial viability, technical and financial risks and robustness of the project and make a decision as whether to develop or walk away from a proposed mine project. This includes mine planning to evaluate the economically recoverable portion of the deposit, the metallurgy and ore recoverability, marketability and payability of the ore concentrates, engineering, milling and infrastructure costs, finance and equity requirements and a cradle to grave analysis of the possible mine, from the initial excavation all the way through to reclamation. Ores (metals) are traded internationally and comprise a sizeable portion of international trade in raw materials both in value and volume. This is because the worldwide distribution of ores is unequal and dislocated from locations of peak demand and from smelting infrastructure. Most base metals (copper, lead, zinc, nickel) are traded internationally on the London Metal Exchange, with smaller stockpiles and metals exchanges monitored by the COMEX and NYMEX exchanges in the United States and the Shanghai Futures Exchange in China. Iron ore is traded between customer and producer, though various benchmark prices are set quarterly between the major mining conglomerates and the major consumers, and this sets the stage for smaller participants. Other, lesser, commodities do not have international clearing houses and benchmark prices, with most prices negotiated between suppliers and customers one-on-one. This generally makes determining the price of ores of this nature opaque and difficult. Such metals include lithium, niobium-tantalum, bismuth, antimony and rare earths. Most of these commodities are also dominated by one or two major suppliers with >60% of the world's reserves. The London Metal Exchange aims to add uranium to its list of metals on warrant. The World Bank reports that China was the top importer of ores and metals in 2005 followed by the US and Japan. 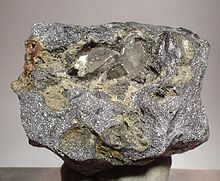 Wikimedia Commons has media related to Ore.